The Knights of Columbus Lenten Fish Fry events will begin at St. Colman on Friday at 4:30 p.m. and will continue through Good Friday. St. Colman of Cloyne Catholic Church will commence with the first Knights of Columbus Lenten Fish Fry today, and organizers are inviting the community to help them with their biggest fundraiser of the year. With Ash Wednesday falling this week, it marked the beginning of the Lent season — a season of 40 days, not counting Sundays, which begins on Ash Wednesday and ends on Holy Saturday. 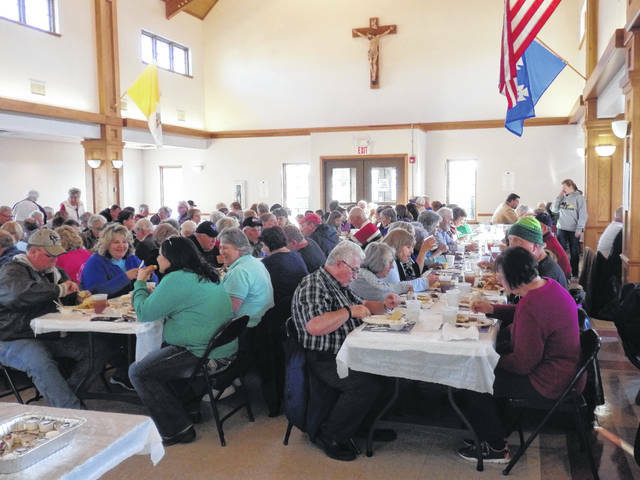 Every Friday during the Lent season, the Knights will hold fish fry dinners to raise money for those who are in need at St. Colman, according to Paul Ondrus, a member of the Knights. Using this money, they have supported many local organizations over the years, including the Life Pregnancy Center, St. Vincent de Paul Society, The Well at Sunnyside, and even non-local fundraising initiatives to help children and many others. The dinners will begin at 4:30 p.m. and will last until 7 p.m. The dinner is “all-you-can-eat” and will feature Alaskan Pollock deep fried in a local soy oil from the Sollars family (as well as baked for those who do not want deep fried fish). In addition they will serve corn, green beans, french fries, grilled cheese, tomato soup, fried shrimp, fish tails, homemade desserts and more. Ondrus encouraged the community to come early as they only serve so much fish, and he said they end up serving around 200-240 pounds of fish each night. For more information about the dinners, call 740-335-5000, email office@stcolmanwch.org or visit them at 219 S. North St. in Washington C.H. https://www.recordherald.com/wp-content/uploads/sites/27/2018/02/web1_DiningHall.jpgThe Knights of Columbus Lenten Fish Fry events will begin at St. Colman on Friday at 4:30 p.m. and will continue through Good Friday.